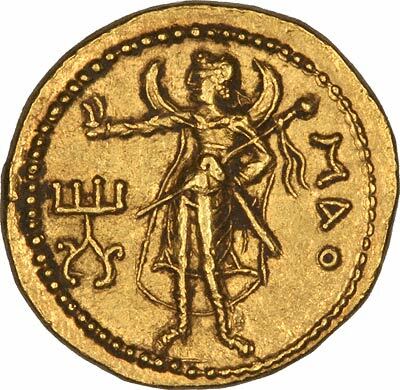 Gold Stater of Kanishka I 19.7 - 20.5 Gold 7.95 King sacrificing at altar, Indo-Greek Inscriptions, reverse moon god deity, standing left, extending right hand over a tamgha (seal or brand). We are still working on a full identification of this coin, particularly whether it is genuine or fake. 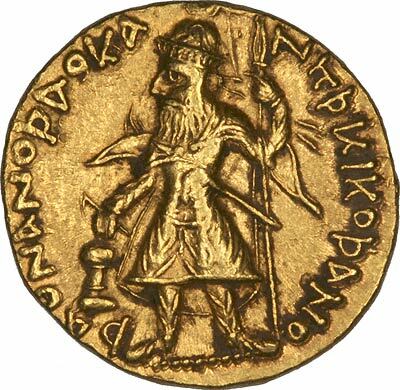 From a comment that the coin looks Indo-Kushan, we looked at a few Indo-Kushan coins on various websites, and found helpful clues. First, the letter "P" is probably a Bactrian Greek letter "san", and not a Greek "rho". Kanishka (Kushan language: KANHÞKI, Ancient Chinese?) was a king of the Kushan Empire in South Asia, in the 2nd century of the common era, famous for his military, political, and spiritual achievements. His capital was in the modern city of Peshawar in Pakistan. Moon god MAO, the moon god "Ma". with crescent horns. One obvious consideration is whether this coin is genuine, we have already had one opinion that it looks to be a fake.